You’ve just discovered that the refrigerator isn’t cooling anymore or perhaps the electric cooker isn’t working. Since it’s still a relatively new appliance, you’ve decided to repair rather than replace it. The next challenge – finding a company with a track record for excellent appliance repair in Beverly Hills! As you’d imagine, there are dozens of companies providing appliance repair in Beverly Hills, all claiming to be the best in the business. Most of these companies even run comprehensive advertising campaigns and have beautiful websites to boot. The problem is – not all of them are reliable. 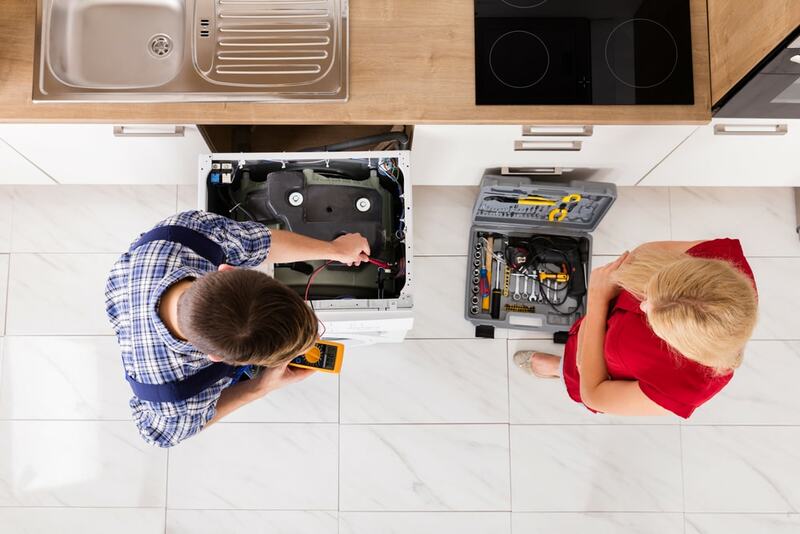 Despite their wonderful social media profiles and powerful marketing messages, some have neither the skill nor the experience to diagnose let alone repair some types of appliances. Instead, of panicking, consider taking perishable items out of the fridge. Then, perform your own initial evaluation to determine the likely cause of the problem. Having a rough idea of the situation can be invaluable during the search for a repair company and gives you leverage when negotiating a price. There are three things to learn from a neighbor, friend, or family who has had a similar issue before; the probable cause of the problem, the estimated repair cost, and their preferred company for appliance repair in Beverly Hills. If you can get a trustworthy referral at this stage, you’re lucky! If you can’t get a recommendation, or even after getting a few names, you need to continue the search online. Among other things, you need to visit each company’s website and social media profile, as well as check with review platforms to get an informed opinion. Once you have some information on each company, it’s time to get a feel of their customer service. So, give them a call. During the call, you need to evaluate the response time and level of concern shown by the company. Any company providing appliance repair in Beverly Hills that doesn’t pick calls or show keen interest in helping you find a lasting solution to your problem is not worth your time. You might have learned a few things about the company’s longevity on their website, but it doesn’t hurt to ask about it again on the phone. While on it, ask whether the company has dealt specifically with the type of problem you’re experiencing. A company that provides specialized appliance repair in Beverly Hills guarantees quality results. This is especially important if you have a modern appliance. You don’t want the unit being handled by a technician who last updated their knowledge 10 years ago. Where possible, the company you choose should have a policy where technicians are trained regularly to keep them up to date with modern technology. All great companies providing appliance repair in Beverly Hills will offer guarantees before you even ask. If there is no mention of such, make it your duty to ask. Do they guarantee that their work will last? Can they provide a warranty to back such promises? Remember that both the guarantee and warranty must be provided in writing. A bonded company is one that has a state-secured fund that is available in case a consumer files a claim. Insurance, meanwhile, protects both clients and the company (including its technicians) in the event of injury or damage. Since both of these are possible scenarios, it’s advisable to settle only for bonded and insured appliance repair in Beverly Hills. For the best appliance repair in Beverly Hills, always go with a company that is willing to share with you details of projects they have worked on in the past and even give you contacts of past clients for purposes of reference. Once you have the contact information, don’t hesitate to make a call to find out even more about the company in question. Finally, and most importantly, never overpay and at the same time don’t go for a cheap fix. Ask for quotes from other contractors offering appliance repair in Beverly Hills, seek advice from your realtor, and feel free search online to see if you can find the going rate for similar projects in your neighborhood. Need Appliance Repair in Beverly Hills? Sub-Zero Experts LA is the preferred Sub-Zero repair company in Los Angeles. Contact us today at (424) 227-5900 for professional appliance repair in Beverly Hills. Thanks for the advice for finding an appliance repair company. I like how you said to start searching online. I’m pretty savvy online, so it shouldn’t be too hard to find someone to fix our fridge. I do like that the article recommends that readers ask the appliance repair shop about their experience before they hire them. After all, certain appliances take a lot more effort and skill to repair than others. For example, if you need your refrigerator repaired then you will want to make sure that the appliance repair service has specific experience dealing with refrigerators. I like that you emphasized the importance of asking for references. Like you said, you will have an idea whether that company has delivered well with their past clients. I will share this with my husband so that we will be able to find a repairman we can trust. Our fridge just broke down this evening, and we can’t afford to buy a new one because I still don’t have a job right now. So it’s important that we hire a trustworthy repairman. That seems like a good idea to find a company that has a policy that you should have technicians who regularly gets trained and keeps up-to-date with newer tech. My dishwasher is not cleaning the dishes correctly, and I can’t figure out what’s wrong with it. Your tips will help me find someone who could help repair my dishwasher. My dishwasher is not working right now and I am looking for an appliance repair service who can come and fix it for me, so I am glad that I found this article. It is interesting that you say to look online at potential companies websites because this way I can see previous customer reviews. Also, I will make sure to look for a repair service who has been in business for a long time and has specific experience repairing dishwashers. My washer stopped working last night in my new apartment and I needed to have my office uniform next week. It was explained here that I can talk to a few neighbors about it and ask them for some advice on how to deal with it. Moreover, it’s advisable to hire professionals for quality appliance repair. Thanks for the tip about checking an appliance repair service online. It would be good to consider their qualifications and experience as well. My husband and I are looking for an appliance service, so we’ll have to check online first. I think warranties are good for easing the mind. It makes it much easier to invest in repairs like this if they are backed up. It gives me a lot of confidence in a company when they offer warranties. Recently, my dryer has been taking anywhere from 2 to 4 cycles to completely dry the clothes inside it. We’ve already had the electrical connection checked and our next step is to find a dryer repair service. I really appreciate your advice to find someone who is experienced in specialized appliance repair and has training at least more current than 10 years ago. I agree that experience is important when finding appliance repair. You want someone who has been in business long enough. You can ask what type of repairs they have experience with as well, like you suggested. Thanks for the tip about going online when searching for an appliance repair service. Checking a company’s website to find out more about them is great advice as well. My husband and I need our washer repaired, so we’ll have to check online first. My stove has been having some problems, so I’ve been looking to get it repaired so I can cook pizza again. It was super helpful when you mentioned to ask them if they are bonded and insured, as this will protect both of you from liability if there is an injury or damage. Thank you so much for all the great tip son how to choose an appliance repair company. I love what you said about finding a certified repairman, especially when dealing with modern appliances. I think that appliances are always being updated so it’s important to contact a proper technician to make smooth repairs. My wife and I are buying appliances for our new home, so we will definitely contact a reliable repair service if we encounter problems. My microwave stopped working a few days ago and I can’t figure out what the problem is. It is a relatively new microwave because I just bought it last year and I want to get it repaired instead of purchasing a new one, so I am looking for an appliance repair company. I like that you say to ask potential companies about their warranties and if they provide them in writing. Also, I will make sure to ask them for references because this way I can ask their previous clients questions about the quality of their work and customer service. My dishwasher has been having a hard time cleaning dishes recently, so thanks for sharing this. I like your point about searching for an appliance repair company online. I’ll be sure to check reviews on their social media so I can narrow down my choices based on what past customers have said. I like your advice to check out the company’s website and to call them so you can learn about their experience and services in order to find one that can provide the necessary appliance repairs for the type of problem you have. When you do this, you might want to make sure they have experience with the brand and model of appliance and issue you have, such as Okeefe or Merritt stove repair. You could do this by talking about the model and brand you have when you call them so you can learn about their experience and discuss the problem it’s having. Thank you for this advice for finding a good appliance repair company. It’s good to know that you should try to figure out what the likely cause of the problem could be. You mentioned this could help find a repair company, and it sounds like it could help especially if you realize you may need to find a specialized appliance repair company. My refrigerator hasn’t been keeping my food very cold, and your article had some great tips for choosing someone that could help me with this issue. I liked how you said to research potential hires online by visiting each company’s website and social media, as checking the reviews on each platform. Thanks; I’ll keep this in mind when hiring an appliance repair service. I liked that you pointed out that I should do research and learn what is a good price for repairs. That is good for me to know because I have been having some problems with my washing machine. So, I should probably start researching prices and companies. My microwave is not working well right now and I am thinking about having an electrical appliance repair tech come out to look at it. I think that it is a good idea to ask your neighbors for referrals for service. If they liked it, then the service will probably do a good job.